Via Daily Intel, the Pittsburgh Press Republican reports that Mitchell, who took a plea deal to avoid being charged with any more crimes, cried and apologized during her sentencing, telling the court that she wished she could take it all back. “I live with regret every day and will for the rest of my life,” she said. 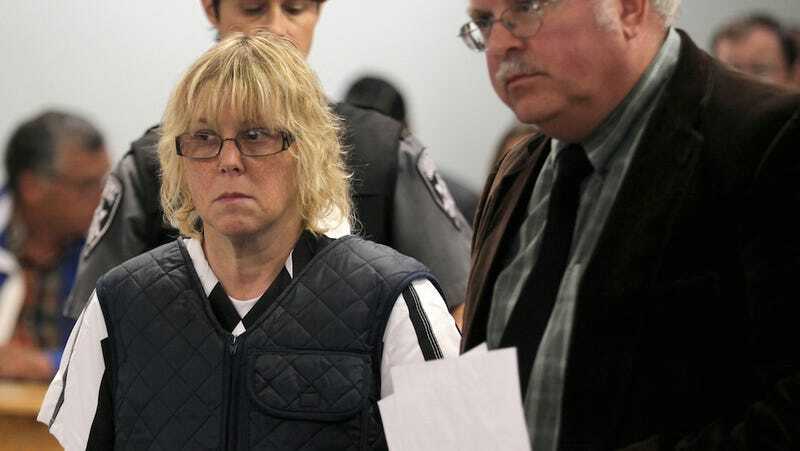 She also admitted that helping Richard Matt and David Sweat escape had been the biggest mistake of her life and that she wouldn’t have done it if they hadn’t threatened to kill her husband, who works at the same correctional facility. While Mitchell and Matt (the “big-dicked” murderer with steel teeth and a racist bent) were in some sort of a romantic relationship, her being scared of him doesn’t sound too far-fetched, considering his rap sheet. Matt—he of the rumored sexual prowess and apparent inability to stop doing murders—had 18 years left on a 25-year sentence for killing a 76-year-old man and dismembering the body. Matt reportedly tortured the victim, William Rickerson, for hours before breaking his neck—all because Rickerson had fired him from a job. Nor was it an isolated incident: authorities say Matt also stabbed a man to death outside a bar in Mexico, where he hid out after the first murder. Matt’s partner, Sweat, had killed a deputy in 2002 and was serving life in prison. While Mitchell’s pleas were emotional, the judge remained unmoved by her declarations of remorse, saying that he didn’t believe that she didn’t have any choice but to help the inmates. And even though her lawyers claim that, based on the scope of the escape plan, there must have been other employees helping, Judge Kevin K. Ryan had some harsh words for Mitchell about her contribution to the escape. Mitchell was taken immediately to prison from the courtroom (although she had a second to mouth “I love you” to her husband) where she will begin serving her sentence of up to seven years. David Sweat is also said to be considering a plea deal.